These tasty little kabobs are the answer to calorie counters everywhere. In small bowl combine vinegar, garlic, rosemary, cumin, salt, pepper, and coriander. 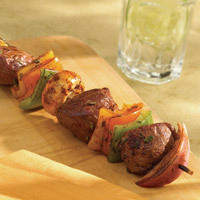 Prepare kabobs by threading lamb, mushrooms, bell peppers, onion, and zucchini onto skewers. Broil 4 inches from source of heat for 4 minutes per side, or to desired degree of doneness: 145°F for medium-rare, 160°F for medium, and 170°F for well. Turn once while broiling and baste with herb sauce.